Inspired by the supernatural is probably the hardest prompt for me to think of something for. Infact I wonder how this prompt ever made it into the 31 day challenge, because I can think of so many other prompts that I would have chosen before supernatural. Anyway, it is what it is, and this year I have done some watercolour ghosts. 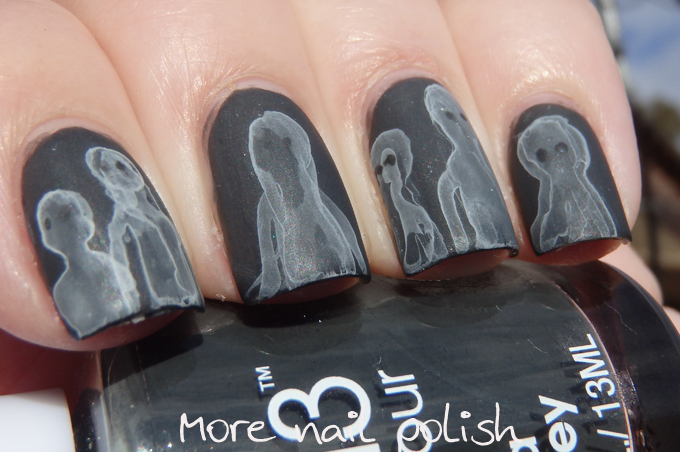 I started with a base of Ulta3 It's a bit grey and then applied matte top coat. 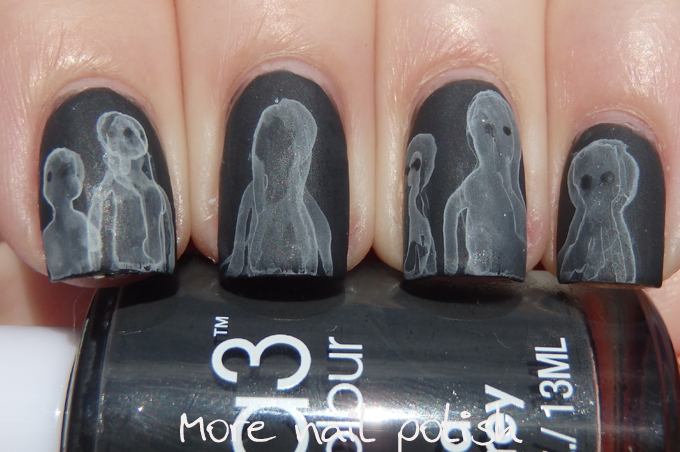 Next I got some watered down white acrylic paint and painted some ghostly figures using the same technique that you use when doing a water colour bubble manicure. I really like how the middle finger turned out. 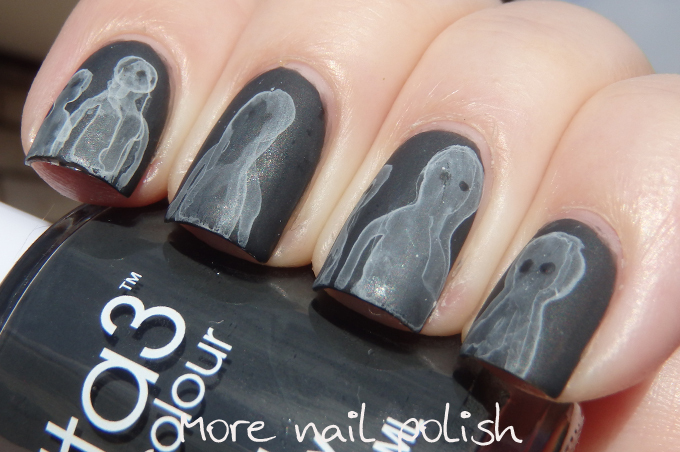 There is something about it that reminds me of Samara from The Ring - which completely freaked me out! The others look a little more alien like with their bald heads and black googly eyes - but either way, they are supernatural enough for me. 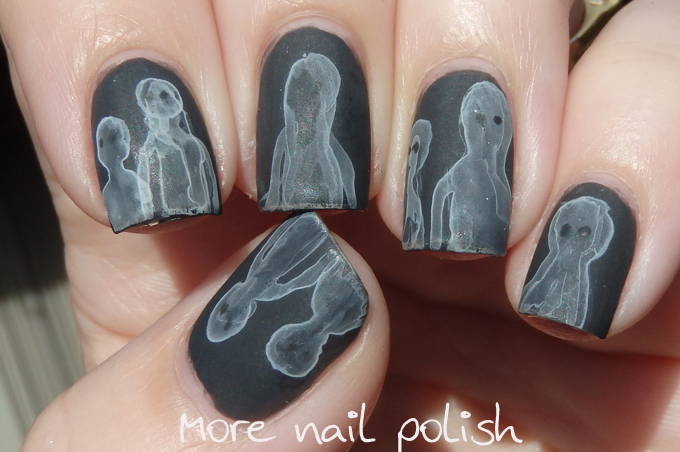 My Inspired by a the supernatural nails from 2013! Holy crap, those are creepy! Fantastic interpretation of the prompt! Wow, these are stunning! You have such talent! So beautiful and creepy, love this!